The Panasonic KVS1025C Scanner has been a excellent purchase. Easy setup and easy to use. We have several in our organisation and would not think of using any other make. I would certainly purchase more as and when the need arises. I bought one of these from Tradescanners 11 months ago. 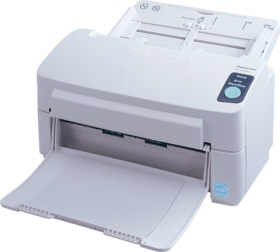 It has a nice range of features and is a real workhorse and it's relatively fast scanning speed is a great help. The easily controlled duplex scanning is a real boon. Our man in IT is extremely happy with the product - so I'd say a good old 5 out of 5! Virtually any type of document, from business card size to legal size, from thin onion skin paper to thick hard ID cards, single sided or double sided,the new Panasonic KVS1025C document management scanner can scan them all in colour or black and white. Fast and reliable, these compact but powerful scanners come with intelligent RTIV image capturing software that maximizes the potential of document scanning with precision reproduction and versatile processing. All of this in a quiet, space saving design that will fit comfortably in most front-office environments - even tight counter-tops and reception areas. The KV-S1025C from Panasonic - the ideal front-office document filing solution.